Bending grade - dull finish and a magnet sticks to it. Can be polished but all pipework will turn brown with heat. Food, Marine and polishing grades. A magnet will not stick to these grades which makes them particularly suited to salt water applications. These grades are less ductile and not suited to bending. Systems have to be made by welding mandrel bends together. Polishes to a chrome like finish, but will discolour with high heat. Away from the high heat areas the polished stainless may go a goldie colour, but will retain its polished finish. Will not rust, long life, salt water applications, can be polished to a beautiful finish. We sell many brands of polished Stainless Steel, such as Magnaflow. 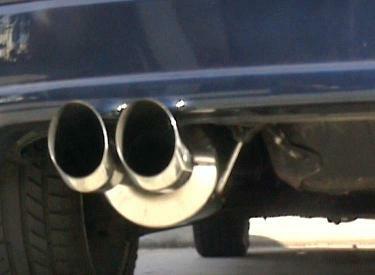 We also source our own Custom polished stainless steel mufflers. These mufflers are made in Australia and are made to fit your car. ie size of body, length, stainless or fibreglass packing, straight through, chambered or baffled to suit your needs.